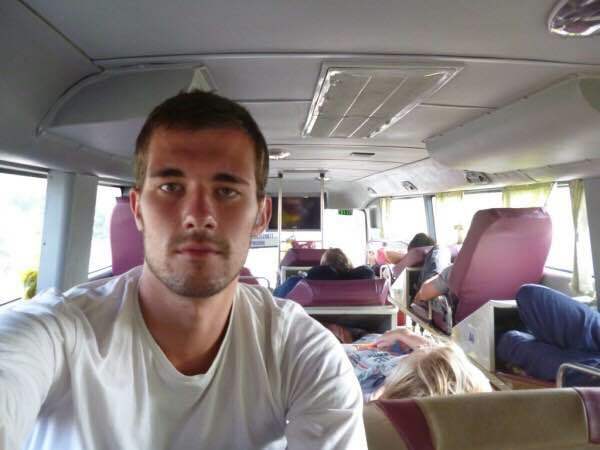 Getting from Hue to Hanoi on the bus can be one of the longest journeys of your life time. It took me SIXTEEN hours. Yes, 16 hours! 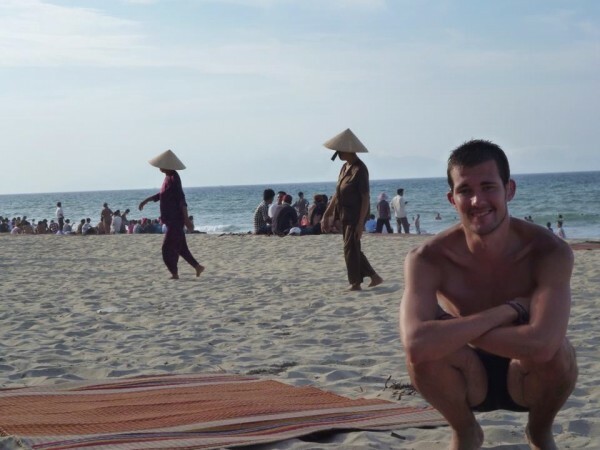 You might just think why didn’t I get a flight from Hoi An in Central Vietnam, my previous destination, all the way to Hanoi in North Vietnam. 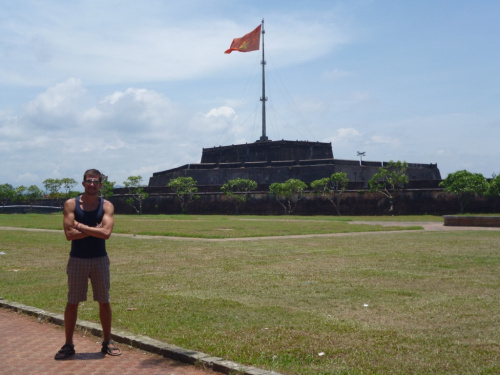 But you simply cannot miss out Hue, the old imperial capital of the kingdom. It’s beautiful, full of history and there’s the Perfume River too! It’s where I got the best pose of my guns too! So, a long bus journey is needed. What can you do to make sure the journey go faster than you can say Vietnamese Coffee? I don’t think I would have survived without my iPhone, iPod and my iPad. If I wasn’t listening to my music (S Club 7, I’m afraid to say), I would be typing up my adventures. You may be tempted to go with the cheapest bus journey, I did. I went on one for $32 and I lived to regret it. The bus looked like it was about to fall apart, the suspension was shot and I swear the bus driver looked he’s just passed his driving test. It was a really uncomfortable journey. So, go upmarket and perhaps take a bottle of champers with you to celebrate! Whatever you do, always get the seat in the middle or the back. Never the front. If you do, you’ll have a panoramic view of the craziest driving in the world where vehicles pass each other by mere inches. I swear I saw a motorcyclist move his arm out of the way so our bus could get pass. Terrifying! Even so, get on first to see if your seat works. Many Vietnamese buses have a horrible reputation that their seats don’t work. My friend and I soon discovered ourselves to find my seat broken that it couldn’t lay down backwards and that her seat couldn’t set upright. Therefore, I had to try and sleep rigidly upright with my feet poking out to the side of the passengers in front of me. Not a nice experience for them! Vietnam is bright at night thanks to over lit establishments and glaring street lamps. Bring a sleep mask to block out the light when travelling overnight from Hue to Hanoi. Toilet breaks are too far and too long in between. We only got two toilet breaks and one of them was at the god forsaken hour of 3am. Many people on the bus simply slept on while I took a tinkle and they lived to regret it with bursting bladders until the next stop. So, if you get an opportunity, be prepared to vault over the seats to rush to the restroom. Toilet breaks don’t last for long and bus drivers have a habit of wanting to get to their destination immediately. So, toilet breaks can last as long as five minutes. Take a quick wazz and while you’re stretching your legs, keep your eyes on the bus driver as they may suddenly climb aboard and turn on the engine for 30 seconds before starting to drive off. There were a couple of incidences when we had to alert the driver of missing passengers particularly one who was running after the bus while hiking up her shorts. If you can get travel sick, bring one. If you don’t, still bring one. There might be someone close to you who will need a sick bag on the 16 hour journey from Hue to Hanoi. I had the misfortune to find a passenger behind me throwing up his guts. The next two hours until our demanded toilet break passed by with the stench of sick in the air until all of us had enough and demanded to be let off. The bus crew cleaned up while we waited. It all could have been avoided with a sick bag. It can get cold in the night, so I recommend you pack a thick jumper to use as a blanket or even to pull on while you sleep. 9) If you’ve been to Cambodia before Vietnam, bring your Khmer Scarf. I simply loved my Khmer scarf when I was travelling on the bus. It can be used for anything as it is body length, thin but warm and soft to the touch. It’s a great tool to use as a blanket or if you need it to use as a quick drying towel after splashing your face. Of course, wash it at the end of your journey. You should never leave your valuables inside your big bag that is stored in the hold. There have been incidences of corrupt bus crews rifling through your bags below. Therefore, it is recommended you take your valuables with you to your seat. However, make your day bag as secure as you can with a combination padlock to ensure no one gets a look in while you are sleeping. It’s 16 hours (if you’re lucky!) from Hue to Hanoi. With rest stops far and few between, take your favourite snacks and a large bottled water (sealed) to survive your journey. There will be food and water at the rest stops but be prepared to see some extraordinary stuff. Could that be dog pieces or seaweed flavoured Pringles? You’re gonna get up close and personal with the people around you. So much more than your current beau. You’ll be acquainted into great detail with smelly feet, bodily noises, snoring and a apologetic smack in the face with an elbow. It’s not all bad, you’ll make fast friends bonding over the journey from Hue to Hanoi and bring a pack of cards as an icebreaker. Although, people may draw the line at strip poker. 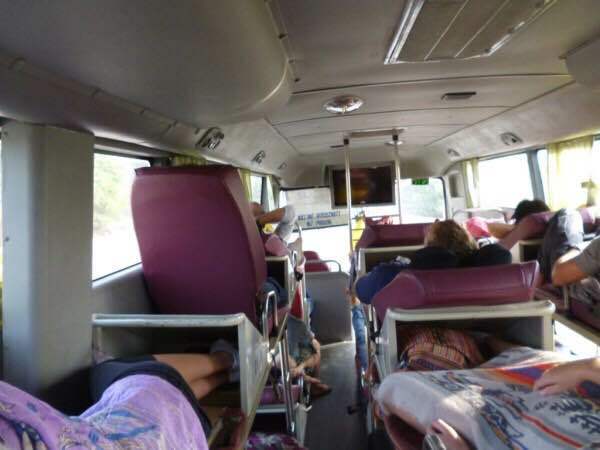 Although this didn’t happen on a bus journey between Hue and Hanoi, I had to sleep on the bus in the aisle as I travelled between Nha Trang and Hoi An. It’s because the bus was over subscribed and I allowed a mother and baby to take my seat. But as I finally rocked off to sleep, I completely slept through a stop where people got off at their destination meaning seats were free. The Vietnamese bus driver, rather than shaking me awake, opted to wake me another way. A huge slap around the face. I never get furiously angry but it was a flash of red for me as I squared up to the driver. But luckily, the rest mist evaporated when I came to my surroundings and calmly discussed why slapping people isn’t a way to wake people up. He apologised and we were friends later after he hugged me and bought me a delicious cup of coffee. But if I continued with a raging temper, I’m sure I would have been thrown off the bus without my belongings with me. Be reasonable and be firm politely. Vietnam in the day is truly beautiful. Particularly more so at sunset and sunrise. Make the most of the daylight and switch off your gadgets to watch the stunning country go by. Chances are you’ll have a paper book with you to read. 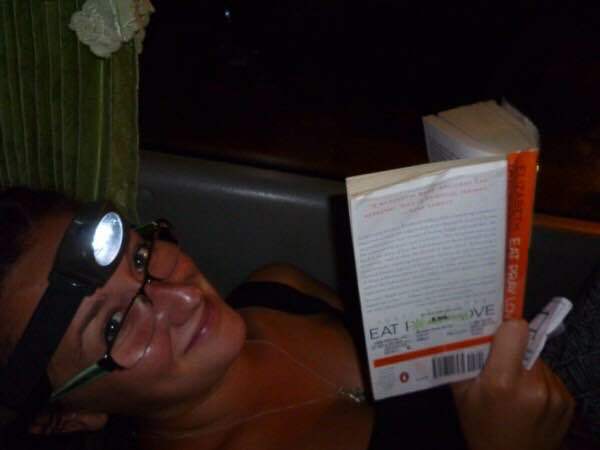 But as the travelling between Hue and Hanoi will involve night time, it’s best to pack a head torch for reading, talking with your new friends and stop you cursing while you fumble the combination lock. As my friend and I would be staying at Hanoi Backpackers when we arrive, we took the misguided assumption that the bus would stop off at a centralised location. No, that didn’t happen. The bus would stop off at several points on the outskirts of the city. Luckily, my GPS on my battery depleted phone still just about worked to get a bearing to help me work out the map within my lonely planet guide to SE Asia while we neared the capital city of Vietnam. We got off at the right stop and voila, only a few streets away were our accommodation was based. In hindsight, we should have spoken to the bus company first to know where to get off before starting our journey. Believe me, you don’t want to stay awake on a moving bus for 16 hours. Thanks to my broken seat, I did exactly just that. I don’t know how I managed but I must have slipped into a stupefied trance. Even if it’s just a piece of shut eye for 20 minutes, you’ll be partially refreshed when you arrive in Hanoi from Hue, ready to explore the city. Say no to tight underwear unless you want red markings on your skin. That’s not even mentioning the sweaty smell that will erupt from your moist nether regions. (Yes, I used the word moist, deal with it). Wear comfy and baggy underwear and your body will surely thank you for it. I’m sure the people around you will too! Do this. 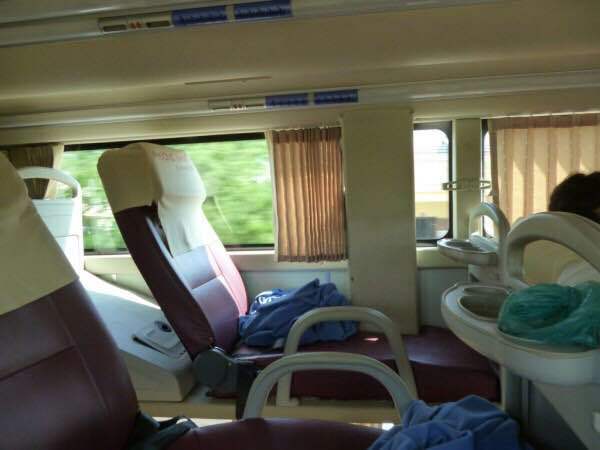 Not only it will make you feel clean and refreshed for the journey but the cooling down from the shower will help you drift off to sleep as soon you settle into your seat. Plus your bus mates will thank you for it. Despite all the horror stories I’ve imparted to you in this article, this journey is actually one of the most memorable and the funniest! I made plenty of friends here and it really goes to show you how you can cope with such an experience. But you’ll love Hanoi as I did. It was worth the journey. Darlin -you tease us with your Khmer scarf and don’t give us a photo? He he he 🙂 And nothing wrong with a bit of S Club 7. Quality Post! I never knew there were buses like this out there, so will go on these when I get to that part of Asia. Great points and tips here. But do these buses have plugs as well to charge up electronic devices? Unfortunately, the bus didn’t have any power sockets. That’s why I said to charge up all electronic devices before you go on the bus. Wow I had no idea there were nice buses lie that! Where are those in Europe and the states?! Looks kind of cozy! Yeah I know! I really think Europe and the States should consider them. Shall we raise a campaign together? I got a hop on hop off bus all the way from Hanoi to Ho Chi Minh for $45. 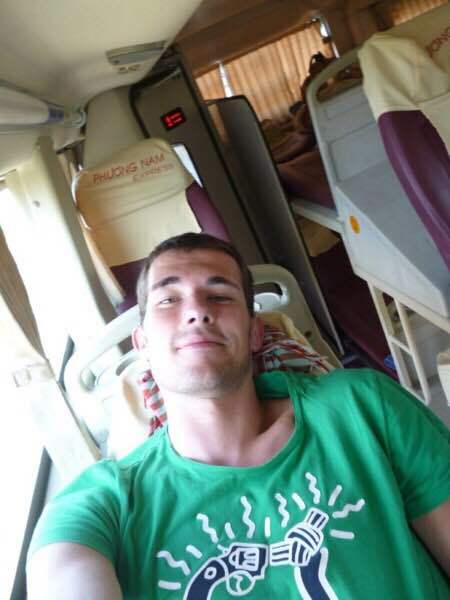 Some were night buses with really thin beds, but they were comfy enough for me 🙂 My longest journey was from Luang Prabang in Laos to Hanoi – 27 hours of joy! I was so sick with a cold that I slept through most of it though. Ouch! Laos to Hanoi! That’s why I opted to travel down Laos into Cambodia as it was much shorter! $45 for that journey?! How did you swing that? !